Lieutenant General Karl Müllner, The German Air Force Inspector, visited the IAF last week as a part of the deepening of the personal and professional cooperation between the forces. During his visit, the General toured IAF bases and the Israeli security industries and learned about some of the IAF's abilities. The General also met representatives of the "From Rebirth to the Skies" Association, Holocaust survivors who served as aircrew members in the IAF, for a personal and intimate discussion about the aching past and optimistic future. The security cooperation between Germany and Israel is close and significant and this is the second visit of the German Air Force Inspector in Israel since he entered office in 2010. Every two years representatives from the force meet for a professional and operational discussion, mutual exercises are held as a part of crew exchanges between the forces and mutual learning between the forces is carried out by way of large exercises and around mutual security challenges both countries deal with. "The relationship between the countries is necessary and deeply significant, I hope that we will continue striding toward new horizons together and I am very optimistic about the relations between Germany and Israel", said Maj. Gen. Amir Eshel, IAF Commander, in a mutual dinner held for the senior commander forum of the IAF and the German Air Force Inspector. "I am excited to see our young personnel working in cooperation, talking, thinking and flying together". Will there be an Israeli Aircraft in German Skies? As a part of the visit, the German delegation led by the German Air Force Inspector toured the Israeli Security Industries and the "White Eagle" Squadron in Tel-Nof AFB which operates the "Eitan" (Heron TP) UAV. The Israeli Air Force has comprehensive knowledge in developing, using and maximizing the abilities of UAVs, so representatives from all over the world arrive to learn from this experience. The "Eitan" is a multi-mission UAV for general reconnaissance, marking targets for the attack of another aircraft, photography of long-range targets and many other missions. Its high endurance ability creates presence in a specific area and allows maintenance of an aerial sequence. During the visit of the Squadron, the General experienced flying the UAV, watched a take-off and landing and heard about the different means the platform has and about its abilities. 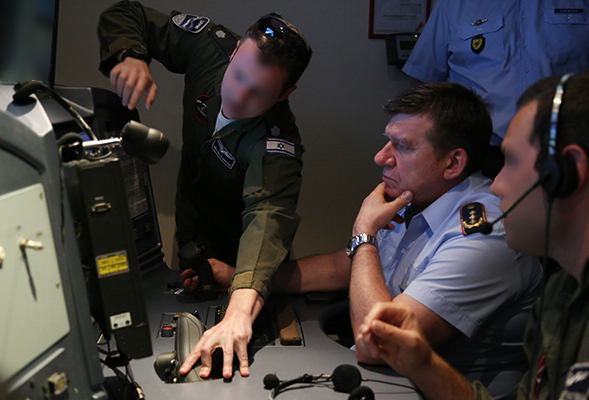 "This visit is a part of a series of senior visits who arrive in order to examine the platforms uniqueness", revealed Lt. Col. Ofir, the Squadron Commander. "This is an important visit for both sides. The German Armed Forces are significant, so the process will bring mutual operational learning". 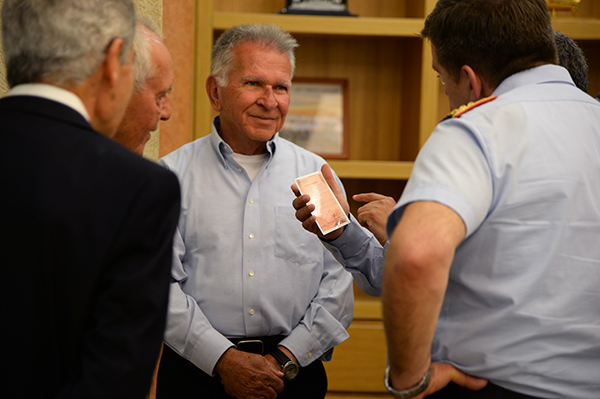 Maj. Gen. Amir Eshel, IAF Commander, arrived at the German Embassy in Israel immediately after landing in Israel from his visit to Moscow where he received the Bundeswehr Gold Cross of Honor from Dr. Clemens von Goetze, the German Ambassador to Israel and General Karl Müllner, the German Air Force Inspector, in honor of the close cooperation and fruitful relations between the forces. 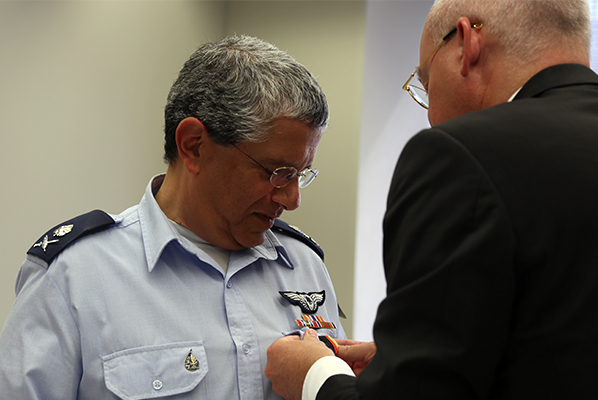 "The nations' past is tangibly present in the cooperation between the forces and the people", said Maj. Gen. Eshel in the ceremony. "We will not forget the Holocaust and look together towards a better future. 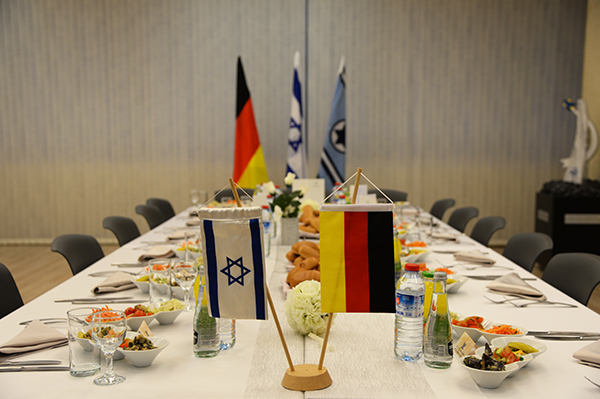 The German support of Israel strengthens our security". 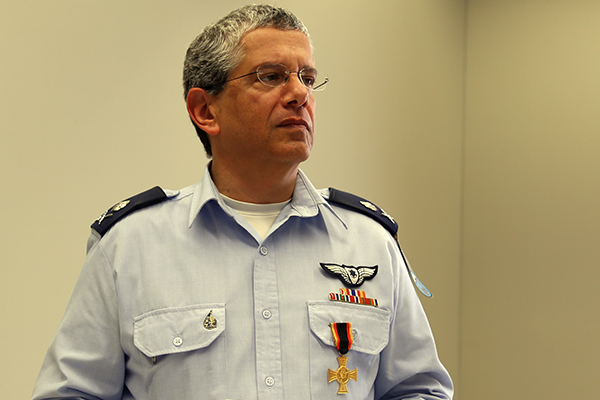 "Maj. Gen. Eshel has always strongly supported the expansion of German Israeli Air Force Cooperation. He has sought to form a trusting alliance with the German Air Force this significantly contributing to the to the fact that our two air forces operate more closely and in a more trustful way than ever in times characterized by normal security challenges", said the ambassador. "Maj. Gen. Eshel is a very honorable and virtuous officer, standing out due to his personality which is in compliance with high standards of ethics and character professionalism and high standards of ethics and character. Virtues like strait forwardness, professionalism, reliability and honesty do not only characterize his professional ethics, he also fills these principles with life. Due to his foresight and confidence in the unique and, despite the horrors of the Holocaust, nowadays miraculously close and friendly German Israeli relations it has been possible to achieve a level of bilateral cooperation never seen before". Despite the strong relationship and cooperation between the countries which include professional ties and tight-knit personal bonds, the history of the two nations' cannot be ignored. As a part of the visit, the German Air Force Inspector met with Col. (Res.) Avi Oren, Col. (Res.) Yesha'ayahu (Shaya) Harsit and Lt. Col (Res.) Moshe Harel, representatives of the "From Rebirth to the Skies" Association, which was established in order to document the stories of holocaust survivors who became IAF personnel. The three presented the project's legacy statue, positioned in IAF HQ, to General Karl Müllner and shared their personal stories with him. Col. (Res.) Harsit shared an occurrence he particularly remembers, when in his visit of Germany, he was asked by a school student what he felt towards the German people. "That was the question I waited for all day that day", he admitted to the general. "I gave him my most honest answer. On the one hand I give you thanks because you are the ones who helped us survive and on the other hand it is an aching story. I have a request, never forget that, because if you will - it will return". "It is inspiring, I think that it is very important", the German Air Force Inspector replied.